Do you have a photo that you just adore and wish you could see all day, even flash it at passers-by? Maybe not ‘flash’ as such, but this piece will definitely start conversation when someone notices it! What am I talking about, you ask? The superbly funky Good Time Ring from Yellowgoat. 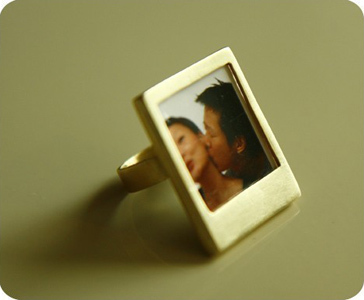 This wearable photo frame in the form of a brass ring is tailor made to fit just you. 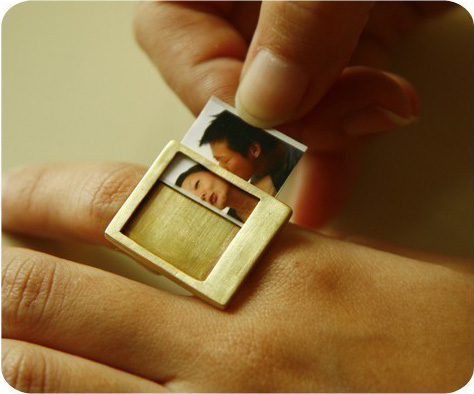 The Good Time Ring allows you to show off a teeny-tiny photo in an equally fitting teeny-tiny photo frame that measures 2.8cm by 2.3cm wide. It goes without saying that the Good Time Ring is a slightly bold fashion accessory and not for shy types. Be prepared to be stopped and asked “where did you get that!?”. If, like me, your dress sense isn’t quite that quirky it makes a super sweet photo frame for dresser, desk or mantle. The Good Time Ring in brass is available from Yellowgoat Etsy store for USD$78. Delivery to Australia is available.